Amberlynn Slavin is an Occupational Therapist and while in OT school she had an idea for an app to help kids with writing difficulties. 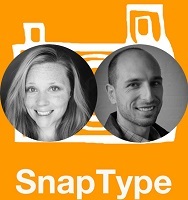 Her husband Ben assisted her in finding someone to develop the SnapType app. Listen in as they explain how they went from knowing nothing about creating an app to having the SnapType app in the app store with half a million downloads. 008 My Wife's Take On Opening A Therapy Practice - She's an O.T.